Cold treat your bulbs to force blooms that will brighten the dreariest winter day. Start with sound, large bulbs. The base and roots of the bulb should be placed in lukewarm water for a few hours. If you cannot plant the bulbs immediately after receiving them, store them at a cool temperature between 40-50 degrees. Plant the bulb up to its neck in a good potting compost, being careful not to damage the roots. Press the soil down firmly to set the bulb securely in place after planting. The ideal temperature is 68 to 70 degrees. Water sparingly until the stem appears, then, as the bud and leaves appear, gradually water more. Continue to water after blooming. When summer comes, sink your amaryllis in its pot outside. Lift and let the bulb dry out during the fall. 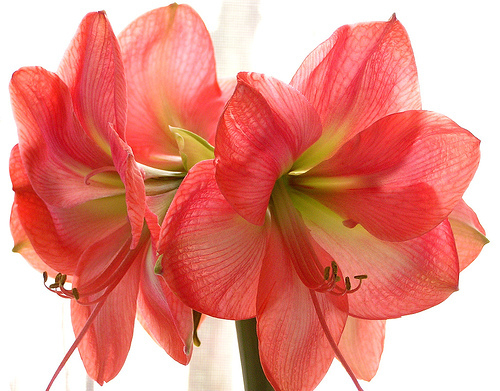 In early winter, move your amaryllis where it will it will be warm and get plenty of light, water…then enjoy your holiday blooms! Of all your outdoor summer flowers, geraniums are the easiest and most successfully overwintered. There are many methods. Because the basement of our 100 year old house is cool and humid, we store ours dormant, which, in my opinion, is the easiest way. My mother has successfully taken cuttings for as long as I can remember. 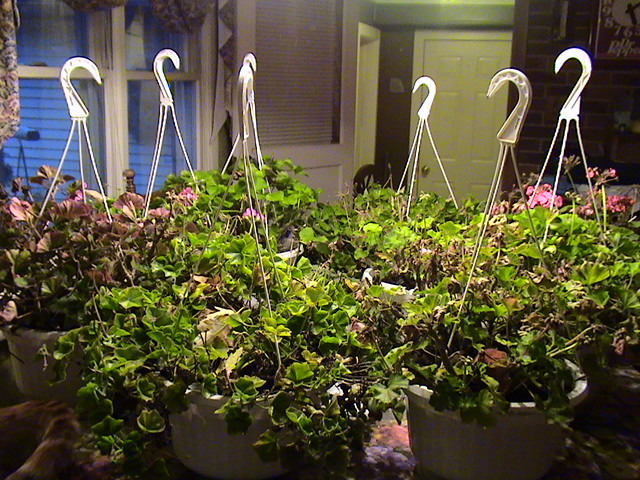 Geraniums can be stored with bare roots and kept dormant in your basement over winter. The success of this method depends on the place you store them. When people had cold cellars or pump rooms, it worked quite well. Temperatures were cool and humid then. Most modern basements are much too dry and warm. But if you want to try this method, just dig up the plants before a killing frost in the fall. Cut the branches back about half way. Remove as much of the dirt from the roots as possible. Do this carefully because geraniums are rather brittle. At this point, they were traditionally hung from the rafters until spring. If you don’t have rafters, you can bag them separately in paper grocery sacks. Leave the sacks open for ventilation. Check your plants every month or so to see if they are getting too dry and shriveling. If necessary, spray them with water. If they get so dry the stems begin to shrivel, take them out and soak them for an hour or two in tepid water. Remove them from the water and allow their surfaces to dry before putting them back in the paper bags. Plants that have been overwintered in this manner may take several weeks to begin growing again in the spring. Soak the geraniums for several hours, roots and all, in water that contains a transplant fertilizer mixed at half strength. To get an early start, you can pot up the plants indoors several weeks before the last frost and transfer them into the ground later. When planting directly outdoors, be sure to wait until after all danger of frost is gone. Geraniums do well as house plants if you can provide them with a cool location and lots of light. Dig them up and pot them just before a frost occurs and cut them back. Check the plants over carefully to make sure they are free of insects or disease. Wintering indoors is stressful; only take indoors plants that are in good condition. Water the plants thoroughly when you first bring them in. Geraniums prefer to stay relatively dry compared to most plants. It is possible to take cuttings instead of bringing in whole plants. A cutting is simply a piece of the mother plant. For best success, use tip cuttings. Cutting off the last 3-5 inches of a branch makes tip cuttings. Remove any flower buds that may be on the cutting, also remove leaves from the lower half of the cutting. To help promote fast rooting, dip the cut end of the geranium into a rooting hormone. Place the cuttings about two inches deep in a clean pot filled with potting soil. The cuttings should be rooted in individual pots. Place a clear plastic bag over the cuttings and pot. For the first few weeks, keep the cuttings in good light, but out of the direct sun. The potting soil should stay evenly moist. After 3-4 weeks the cuttings will have developed strong roots. After they have begun to root, remove the plastic bag and give the cuttings stronger light. 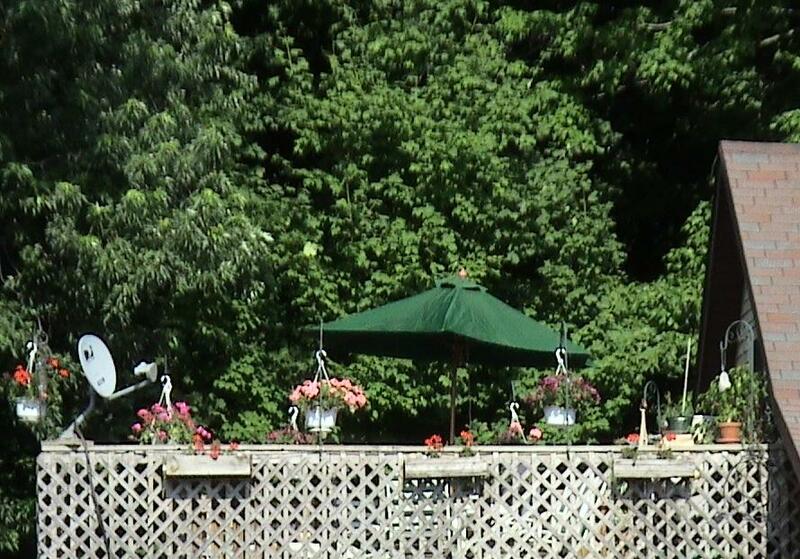 When you begin to see new growth, move them to a cool, sunny location and feed monthly with a water-soluble fertilizer. If you don’t have adequate light indoors, geraniums do very well under fluorescent or incandescent plant lights. Given enough light, geraniums will develop into well-branched, strong plants by spring. If light is not adequate, they may tend to grow rather tall and spindly. Remember, geraniums like it on the dry side. Geraniums that have been overwintered can make very satisfactory plants the next season. Those brought through as cuttings will be completely new, productive young plants, just like those you might buy in spring. The geraniums you overwinter actively growing will be larger plants with heavier stems. They will bloom almost as much as a young plant. Geraniums that have been overwintered dormant take several weeks to recover in the spring and often need to be cut back to improve their shape and productivity. No matter how you overwinter your plant, don’t put them outside until you are sure there is no danger of a killing frost. The end of summer neglect and frost have taken their toll on my geraniums. What a breath takingly beautiful photograph ! And thanks for the directions on caring for this beautiful flower. Mine blooms in spite of me. Really don’t know why. But perhaps I will have even better blooms now that I know what to do. Thank you for your kind words. I have to give my husband the credit for the flower directions. He grew up with a grandfather that was an avid gardener and he learned a lot about plants while he was young. So now he is teaching me. Please keep passing those time honored directions along! And, oh, by the way, you helped me get through Thanksgiving with some of your great recipes … and directions! Perhaps my kitchen and I will become friends given a little more time. But while I wait for that to happen, I keep on collecting cook books. Love the pictures … and think, well, maybe someday. Just for the record … no one has starved yet, and no hospital visits. That’s progress, don’t you think? Ooh, absolutely lovely. Did you take the photo? I’d love to be able to take photos like that. My amaryllis hasn’t bloomed for about two years now and I wasn’t sure why. Now I think I know.